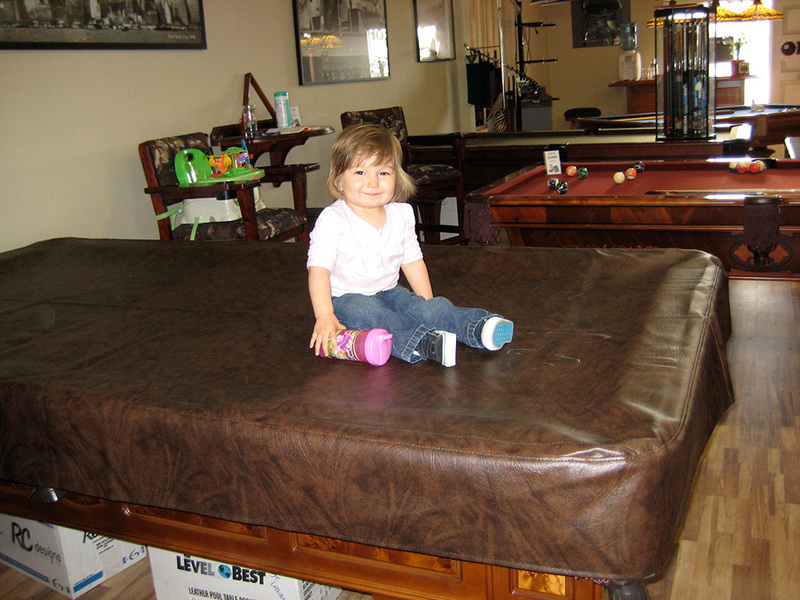 A good, heavy duty fitted cover can protect your pool table from life’s little mishaps. Even plain water can leave ugly spots on your billiard cloth. Toy cars love using top rails as racetracks as we have also learned having a couple of little ones around our tables around in the showroom. Dog and cat hair notoriously puts a strong grip on the surface cloth. Especially from kitties who love to nap on top. But, the biggest threat to your pool table is direct sunlight. The rays not only fade your felt in a hurry, but also make leather pockets and cushion rubber deteriorate at much faster rate. Bad cushions and cracked leather pockets can leave your pool table virtually unplayable. And, repairing these items can have a hefty price tag. Slow down the aging process with one of our high quality fitted covers. Most fitted covers are lightweight vinyl, mass produced to fit most pool tables. Ours are made from double stitched marine grade Naugahyde, come in a variety of colors and can be customized to fit any size table. Square cornered, extra wide rails, pro-8, antique snooker tables, coin-ops, even the Aramith FusionTable can all have properly fitted covers. Even additional drop lengths can be added for outside patio pool tables. Visit our showroom or call with your table’s outside measurements to find the right fit. We stock different sizes and colors. Not in stock, don’t worry! We will have one custom sewn for you.